When acquiring and purchasing new tools, Scharnagle believes in aligning with smart, experienced people with agnostic knowledge on different technology products. He relies on these experts to ensure all technology decisions align back to the overall business. This approach alleviates the potential to get stuck on a point-in-time technology decisions and helps Scharnagle make justified decisions on any new investments. 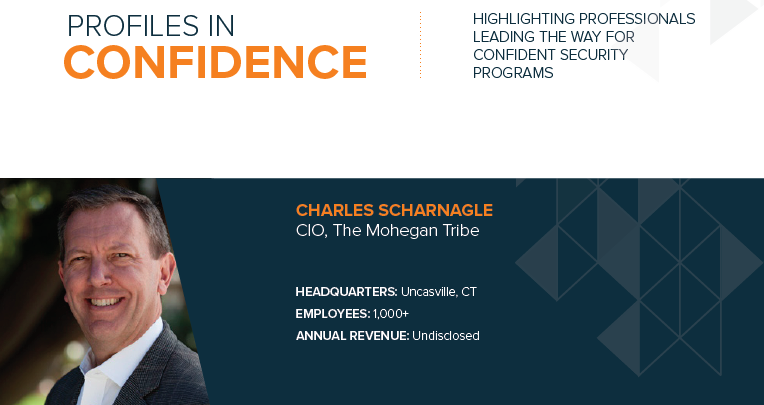 Located in the quiet town of Uncasville, Connecticut, retaining and attracting talent poses a unique challenge for Scharnagle. As with many organizations who recruit IT and information security talent, the small talent pool may be exhaustive at times, and even more so for Scharnagle being located further from major cities. However, the desire to work for an organization with a healthy work life balance is attractive to many people and something Scharnagle pushes when recruiting. Perks include an 8:30-4:30 workday, full-size gym on site, and a smaller, more connected community environment. Scharnagle strives to secure budget so his team may engage in various trainings to stay up-to-date and fulfilled in their careers. He sits down with his team at their regular meetings and asks about their training goals for the quarter. He believes in asking them about how they want to build their career, what they need to do their job to the best of their ability, and how he can help them grow. Overall, he believes in investing in his team so they continue to build their skillset, enjoy their work, and set aspirations for future growth.